Arbuckle Coffee Pot. After this block was installed, Arbuckle Coffee in Arizona was contacted to see if they would allow their coffee to be sold in the local gift shop. We are now the only place in the southeast where you can buy Arbuckle Coffee. Mary Jane’s, a local restaurant, sells Arbuckle Coffee by the cup and it has become their best selling coffee. Corporate headquarters of Arbuckle Coffee requested a quilt made from the quilt block design to hang in their corporate offices…connecting Arizona with western North Carolina! Location: 30 Wanna B Lane, Burnsville, NC. Designed by Martin Webster, drafted by Deborah Palmer and Dot Gibbs, painted by Cheryl Hughes, Carolyn Bareford, Dot Gibbs, and Katherine Hancock. Installed by Billy Shade. Edna Boone didn’t always live on Arbuckle Road. She lived about three miles from there, just below the Liberty Hill Baptist Church, but the man she married lived on Arbuckle Road. As a homesick bride, Edna didn’t like it much in the beginning, and went to see her mother two to three times a day. However, she and her husband built a home on Arbuckle Road in the late 1950s, and Edna eventually grew to love it. 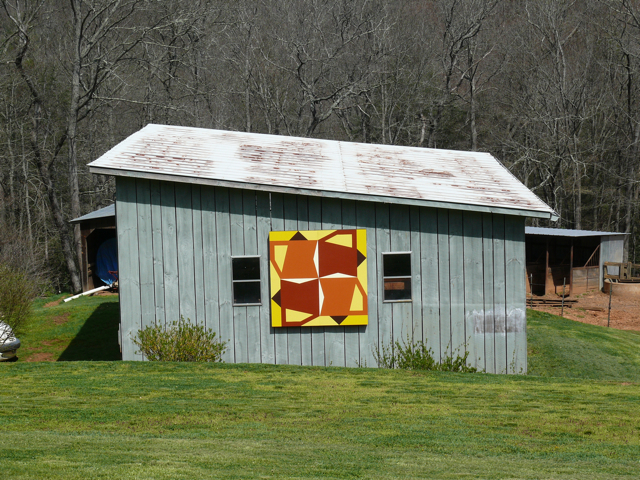 Jeff Boone, Edna’s son, wanted to give his mother a quilt block as a birthday gift. Edna had begun noticing the quilt blocks hanging throughout the area, and she would comment, “Oh, that’s so pretty!” He wanted to give his mother a quilt block that represented something meaningful to her, and Arbuckle Road, where she has lived for so many years, seemed ideal. He also considered that for others in the community, it could be somewhat of a history lesson. Over the years, he and so many others were curious about how Arbuckle got its name. Now that question can be answered–thanks to Jeff’s research and the resulting Arbuckle Coffee Pot quilt square. Further research uncovered some other interesting Arbuckle facts. Traveling salesmen came through the western North Carolina area selling Raleigh products and Stanley products, and also Arbuckle coffee. In 1896, North Carolina granted a charter to the Linville River Rail Road Company to build and operate a railroad from Cranberry to some point on the Linville River and from there to points on the Catawba River and the Watauga River. The line was surveyed from Cranberry to Saginaw (now Pineola) North Carolina, home of the small Dolliver and Nagel sawmill. Like many other small circle mills, it cut mine timbers, lumber for local use, pulpwood and tanbark. The Camps acquired timber rights in the area and planned to build a large sawmill at Saginaw. Jeff decided to use Arbuckle Coffee Company’s logo colors in planning the design to be used for his mother’s birthday gift. He forwarded the web site address to Martin Webster, about whom Jeff says, “He is such a talented artist.” Martin took it from there, coming up with the unique design for the Arbuckle Coffee Pot. Posted on March 22, 2011, in Barn Quilt Champions., Quilt Blocks., Supporters & Sponsors., What's the impact? and tagged Arbuckle Coffee, The Blue Ridge Stemwinder. Bookmark the permalink. Leave a comment.